Last night was DemoCamp 26: a forum for people to show off whatever they have to demo. It’s a good way to network with the tech community in Toronto, and see emerging new applications often before they even launch. We started with a keynote from April Dunford on lean marketing, a topic that many of the startups attending were taking to heart, before we moved on to the demos. The first demo was by Krispy, a long-standing member of the TorCamp community (and a serial presenter at DemoCamp), announcing the beta launch of his latest project, OpenApps. 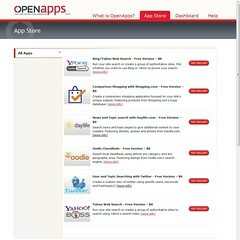 OpenApps is a platform for you to add applications to your website without writing code, or even having to edit your site at all. Their app store has both free and paid (monthly subscription) apps, and an open model to allow developers to add their own apps. In the beta release, there is a fairly small set of apps – Bing and Yahoo search, comparison shopping with Shopping.com, news/topic search with Daylife.com, Oodle Classifieds, and Twitter user/topic searches – but they list a number of other potential apps such as zip/postal code lookups. The best way to understand it, however, is to try it out. I did this in about 3 minutes (although, to be fair, I had seen Krispy demo this last night). Click through for the full-size image, and you’ll see that OpenApps has replicated the look and feel of Column 2 (which is built on WordPress), including my header, sidebar and styles, and inserted the Daylife page based on the BPM keyword into the content portion of the page. Very, very cool. To be able to publish this, I filled out the subdomain section of the application parameters, and changed my DNS to create a CNAME record “news” to point that subdomain to OpenApps, but they even provide links to step-by-step instructions from some of the popular domain registrars on how to do this. That took me another minute. I also had to sign up for a Daylife API key so that I could publish their content. There went another minute. That produced a page, news.column2.com, publishing Daylife content based on the BPM keyword, that appears to be part of my site, all done in about 5 minutes (plus wait time for DNS propagation and Daylife API account approval). The page, of course, isn’t really on my site. 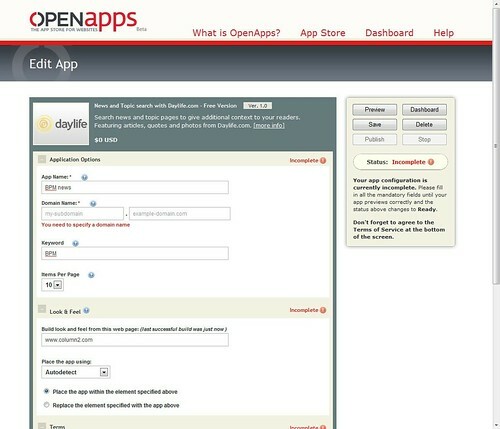 The DNS change means that that URL redirects to OpenApps for the presentation, with the app content section redirected to Daylife. Still, it’s all pretty seamless. The magic part of OpenApps, where they make it look like my existing site, has to do with their technology to auto-locate the injection point for content for a number of common web content management systems, including WordPress, Joomla, Typepad, Movable Type, Drupal and Blogger; there are also methods to use a more complex manual detection process based on the page elements if you’re not using one of those platforms, or are using them in a non-standard way. 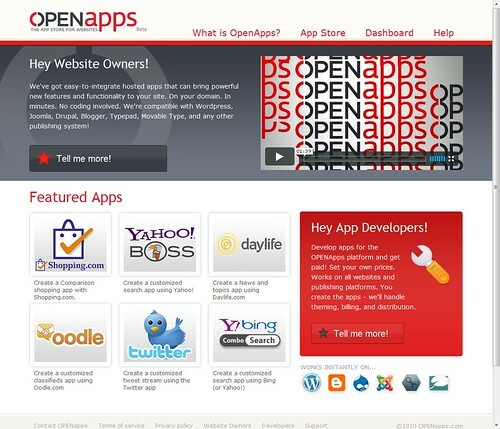 OpenApps is free to use; Krispy told us that developers who create apps for their app store retain 70% of the revenue, meaning that OpenApps is monetizing on the 30% commission that they charge to the app developers. Glad you found the setup so easy! Keep the feedback coming and let us know what other apps you might find useful.